These super fluffy Banana Oatmeal Pancakes are made with oat flour, eggs and yogurt– three healthy breakfast ingredients, lightly fried in coconut oil, for a delicious family friendly breakfast. My son has begun to refuse all three of these ingredients on their own, but happily eats these pancakes! I wrote recently about my high hopes of being able to raise a naturally healthy eater, and how becoming a parent has humbled me. I am seriously hoping my little one is just going through a “bread and watermelon” phase, but until he gets out of it, I have to come up with creative ways to make sure he is getting all he needs. 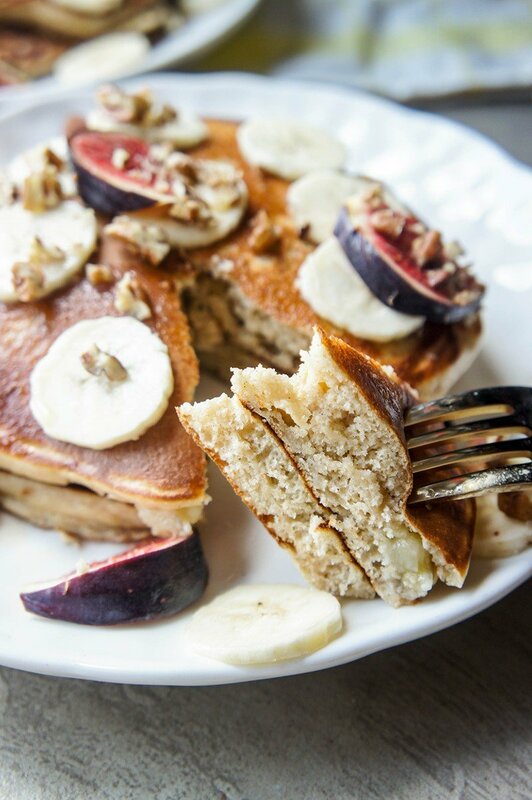 These Fluffy Banana Oatmeal Pancakes have been a great trick. 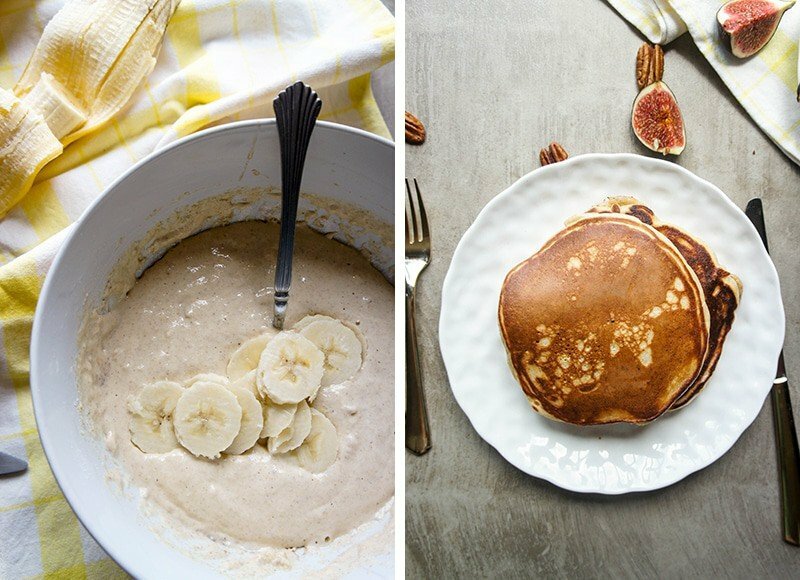 Eggs, yogurt, and oatmeal– very healthy breakfast ingredients he no longer wants to eat on their own, create magically fluffy pancakes when combined. We started making these in the summer, based off Cookie & Kate’s Caramelized Peach Oatmeal Pancakes. Over the past few months, we have made variations and tweaked them until they were just a perfect fit for us. The other recipe my son has been gobbling up like no tomorrow? Green Pumpkin Pie Smoothies— I make his without the protein powder, and add 1/2 tablespoon coconut oil for some extra healthy fats. Between those two meals, he’s getting green and orange veggies, whole grains, eggs, yogurt, and healthy fats. I can relax the rest of the day and not worry too much about what he does or doesn’t eat. And even if you aren’t trying to feed a picky toddler, these make a simple and wonderfully healthy breakfast. We don’t even top these with anything but fruit and sometimes a little real butter. To keep things less-messy for Xander, I fry his in a little extra coconut oil, which is naturally sweet and makes it crispy around the edge. I use a bit less coconut oil for myself, because I like to add extra fruit and some butter. Make it Ahead: I make a double batch of this batter, and then make pancakes for my son for 3 mornings (plus I have them myself on one or more of those mornings!). I haven’t tried making them and reheating them, but I can’t see why they wouldn’t toast well. Make it Gluten Free: If necessary, be sure to buy a certified gluten free oat flour. Make it Dairy Free: Substitute a non-dairy soy or coconut yogurt for the dairy yogurt. Lower the Calories/Increase the Protein: If you’d like to make a higher protein, lower calorie breakfast, substitute 4 egg whites for the 2 eggs, and use a non-fat yogurt. This will save 50-70 calories and add 3-5 grams of protein per serving, depending on which yogurt is used (in place of the low fat yogurt I used in the nutrition analysis). Swapping berries in place of the banana will also lower the calories and sugar content. Mix it Up: We’ve made these pancakes with peaches, blueberries, and mangoes, and I’m pretty sure my nephew threw some chocolate chips in one morning. Any fruit you’d typically add to pancakes will work in here! 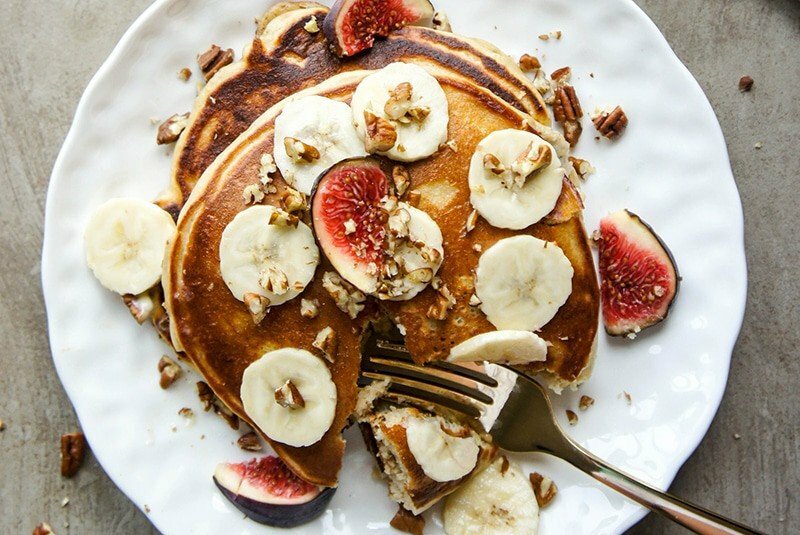 These delicious, fluffy pancakes are a very healthy breakfast in disguise! Made of high protein eggs, yogurt and oat flour, they are sure to get the attention of kids and adults. Customize wity any fruit! In a bowl, beat together eggs and yogurt. Add oat flour, cinnamon, baking soda and sea salt. Mix together until all the flour is wet (be careful not to over mix or you will have chewy pancakes instead of light and fluffy ones!). Thinly slice banana, and fold into batter. Add coconut oil to a frying pan, and preheat the pan over medium high heat. Once the oil sizzles when a drop of water is splashed in the pan, reduce the heat to medium, and add 1/2 cup of pancake batter for large pancakes, or 1/3 cup of batter for small pancakes. Once bubbles appear on the top of the pancakes, flip, and cook the other side until they are cooked through. I feel these cook better on a slightly lower temperature than typical pancakes to keep them from being raw in the center. I use 1/2 tablespoon of coconut oil for a pancake when I make these for my son to add extra healthy fats to his breakfast. Recipe makes 4-1/2 cup pancakes, or 6-1/3 cup pancakes. *I prefer to make these with a store bought oat flour, rather than grinding my own. You can grind your own by adding whole rolled oats to a blender. You will have a finer flour that makes a more traditional textured pancake if using a high speed blender. 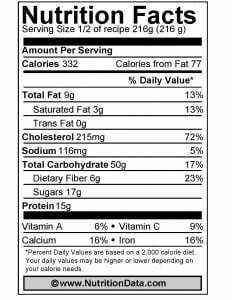 **These ingredients are not included in the nutrition facts listed below. 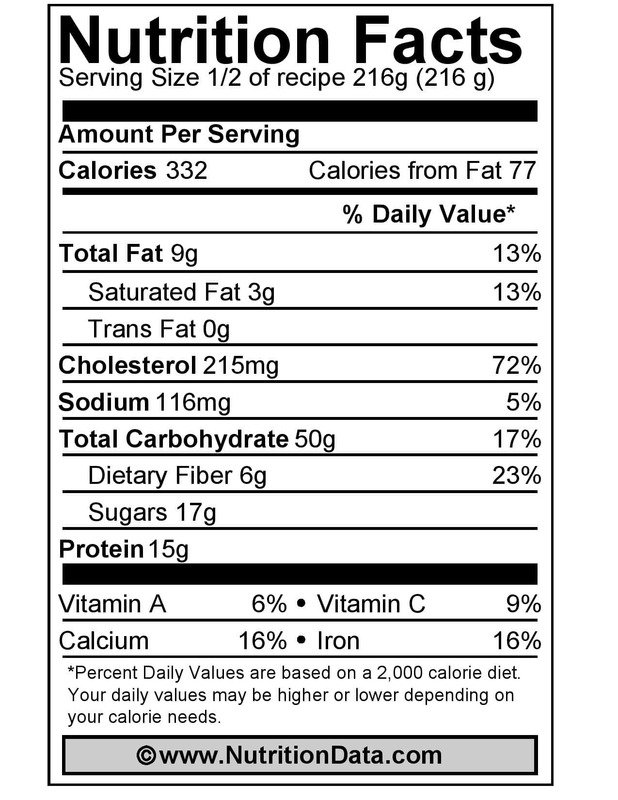 Nutritional data for Our Favorite Fluffy Banana Oatmeal Pancakes and nutrition fact image courtesy of www.NutritionData.com. These look so delicious! I'd be all about these! I LOVE the look of figs in pictures, they are so pretty! Great job! I know-- I have to admit, those figs were an impulse buy after looking at my Instagram feed! Thanks for the tip about grinding rolled oats for a finer flour. I've been eating a lot of raw "over night" oatmeal with yogurt. This sounds like a good recipe, and nice change as well. Thank you. these look amazing especially with all the fresh figs...one of my all time fave fruits! The figs were really wonderful! My mom picked a whole box of them off my grandfathers tree. She pureed them and is saving them for me to use the next time I'm at her house. I can't wait to do something with them. These looks so delicious! I'm loving fig season this year! There is nothing better than a fluffy pancake in the morning for me. I love how you topped them with the figs! I agree Igor! 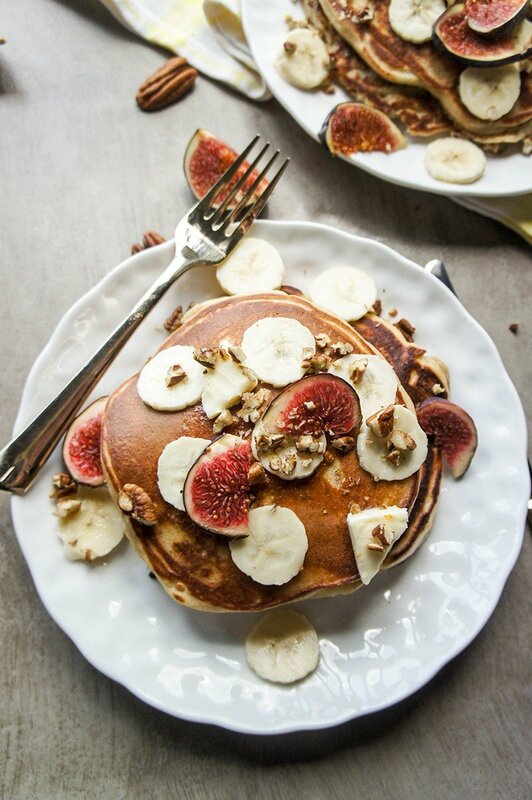 The figs really dressed up an ordinary banana pancake! 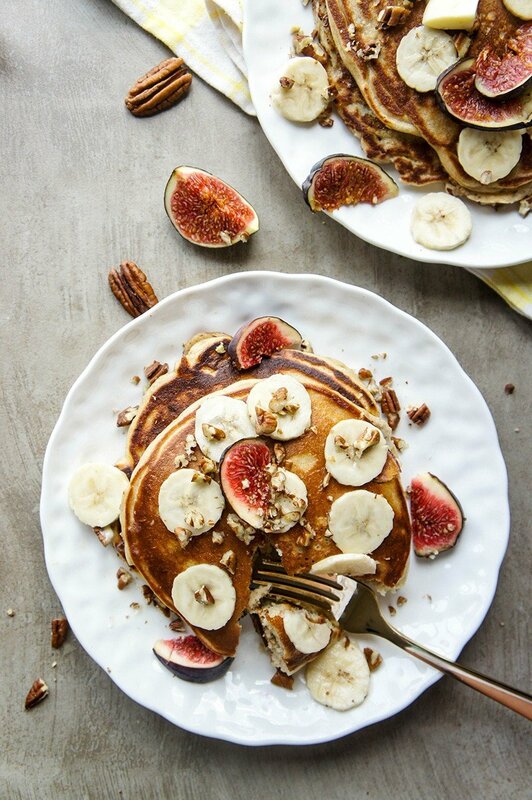 Yes to banana pancakes! They are the perfect Sunday morning breakfast and we make ours with oat flour too. These pancakes looks so fluffy and delicious. Love the figs, too! Best looking pancakes ever, Michelle! Thanks Robyn :) We've been loving them. Your photos are just stunning. I want to take a bite out of the screen. Just a side question, what brand of coconut yogurt do you use. I cant remember the brand I bought the other day but it was thin like milk...want a thick coconut yogurt. Suggestions? Sharing! The pancakes look perfectly fluffy and great for soaking up maple syrup! LOVE that they are healthy!